Thank you for visiting this website. Your comments are valuable! Can I improve these pages? Can we discuss any issue, which bothers you? Unless you don't want me to, I can also include your comments on the website. Take a few minutes off and send me your e-mail! If you clicked on this page, you will have already viewed a few of these pages. They view the mind from a new perspective. 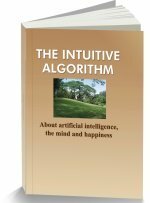 The guiding concept is that the mind does not compute - it senses patterns. These pages will not be peer reviewed in a scientific journal. The ideas are too far ahead of current research for them to be acceptable to science. This website suggests that your nerve cells carry gargantuan memories. Do you have an alternate view? Can you explain the precision and reach of human memory through any other phenomenon? Have the ideas been explained understandably? Is it not true that you grasp the ideas in this sentence in the few milliseconds in which you read these words? 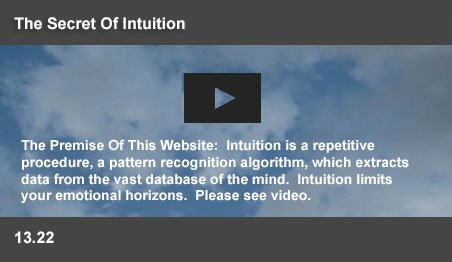 If we assume that intuition enables the mind to sense patterns instantly, would it not explain so many of the things we do intuitively? Have the ideas been explained understandably? Is it not true that your view of the world swings rapidly between anger, joy and boredom? Is it not true that each is a blinkered view? Are emotions not signals, which create “levels of consciousness” - world views along with drives with specific strategies? This website suggests that you have a rational prefrontal intelligence. The Buddhists have claimed that you can see a flower as being “neither ugly, nor beautiful.” Have you experienced a time when you could see the world, unemotionally? Did you ever think that boredom as an emotion, which manipulates your behavior? Do you recall other life situations, where a emotion controlled your behavior? Will power has been explained as a conflict between RI and emotions. Is that an understandable concept?